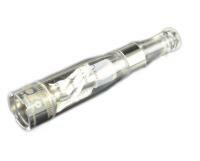 E Vapor Clearomizer for gogo vapor pen and oth 510 thread pens. Unscrew the Gogo e vapor clearomizer from the battery. Unscrew the drip tip from the Gogo e vapor clearomizer. Fill Gogo e vapor clearomizer to the designated line.